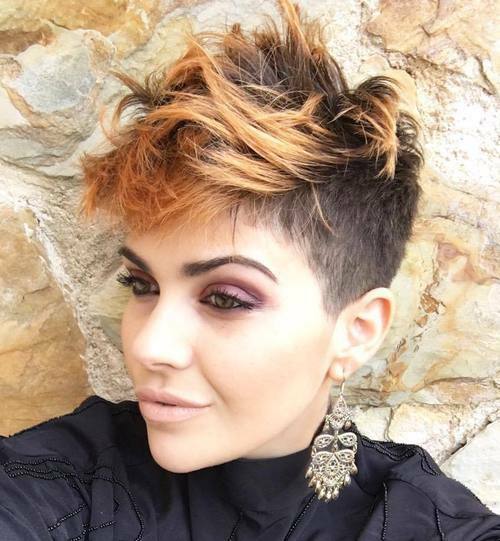 If you’ve got gorgeous short hair and you’re looking for a little inspiration, then Her Style Code might just have exactly what you’re looking for. 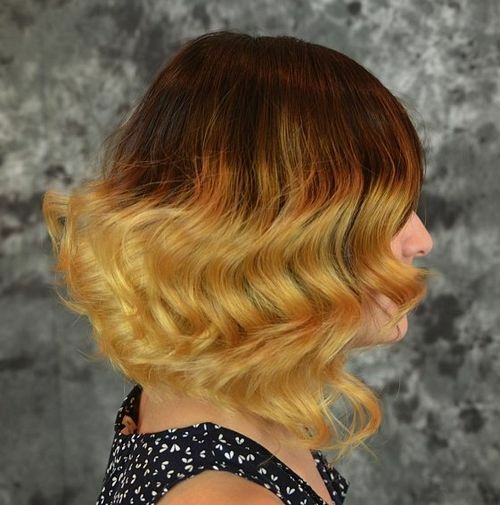 Ombre is a hair technique which blends one color to another seamlessly, and it can be an incredibly beautiful and oh so gorgeous hairstyle to work with! 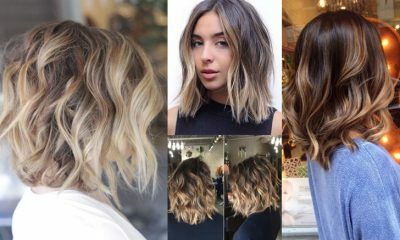 We adore ombre styles on shorter hair, so here are our favorite ombre hairstyles on shorter hair to provide you with the ultimate inspiration. 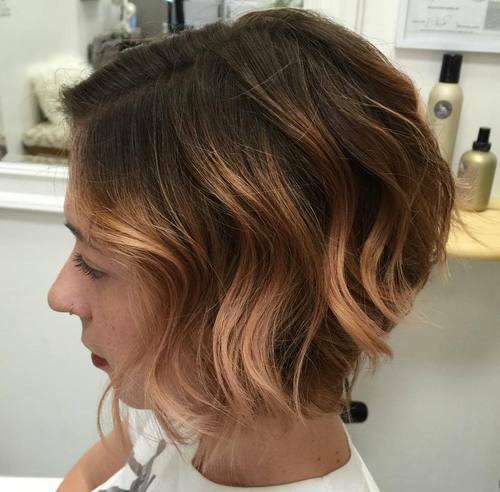 We just can’t stop swooning over this glorious wedged bob! 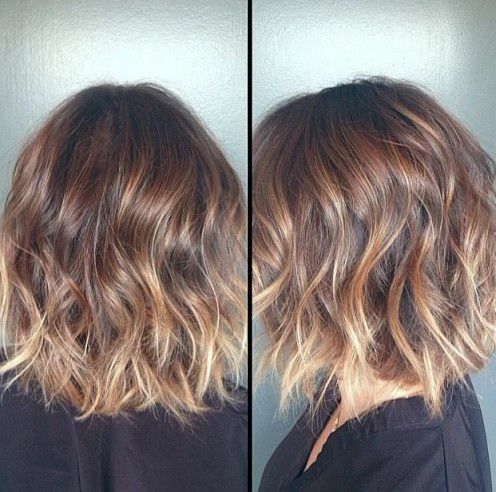 It has lovely short layers throughout the back of the hair to create an incredible curved silhouette, and the loose curls throughout just make the gorgeous ombre transition from brown to copper even better! The hair is parted to the side and full of bounce and volume – we love it. 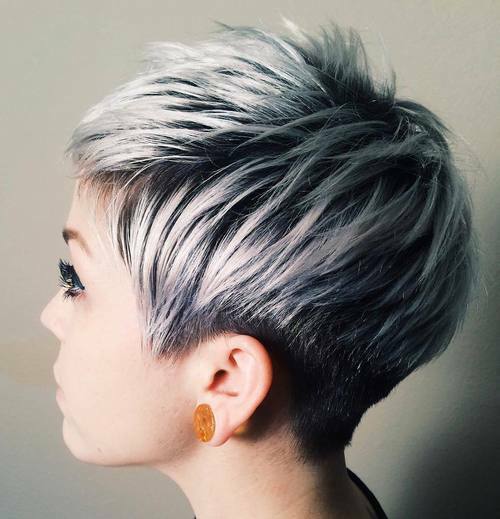 This lady has worked the most unique style into her hair, creating a truly one of a kind finish that we just can’t get enough of! 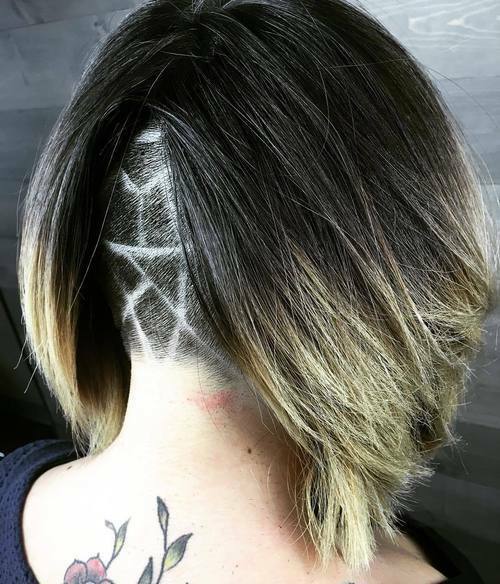 The underneath layer of hair is shaved close to the head, and finished with a pretty pattern shaved into it. The top layer forms a classic bob style which is an ombre blend of dark brown to blonde, swept aside to reveal the pattern underneath. 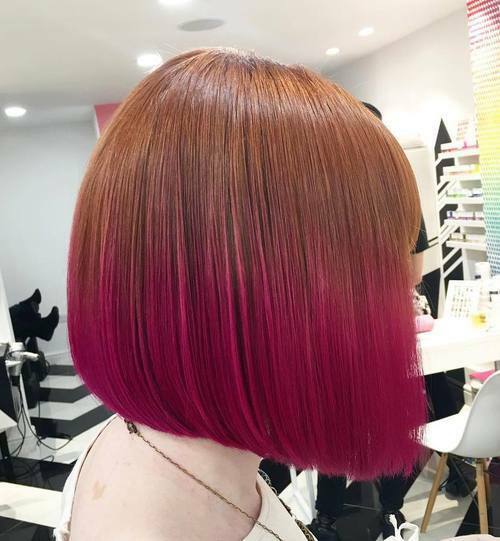 This wonderful, sleek and glossy bob has stolen our hearts – we just adore the vibrant ombre blend from ginger to hot pink! As if the colour transition weren’t quite enough, this lady has opted for a super stylish and straight bob with a lightly graduated line going from back to front, finished with a fringe which frames the face to perfection. 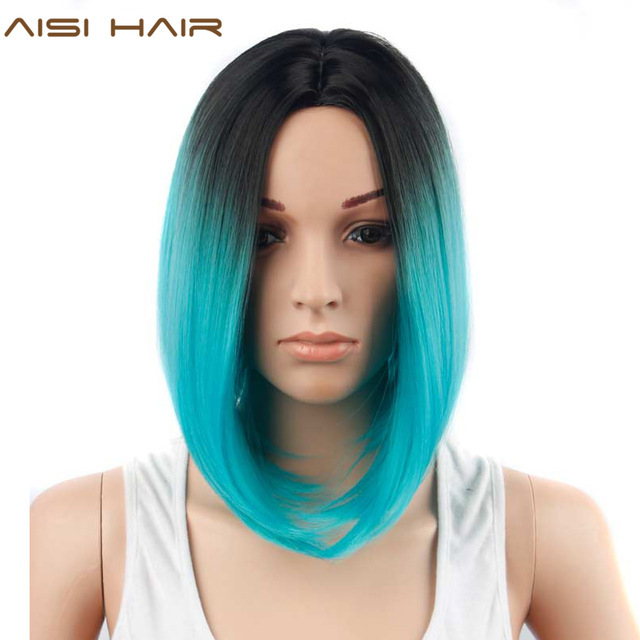 Also you can try the straight wigs, check it out here. This utterly incredible hairstyle finishes longer towards the front and around the jaw line, and shorter at the back of the head in a graduated line. 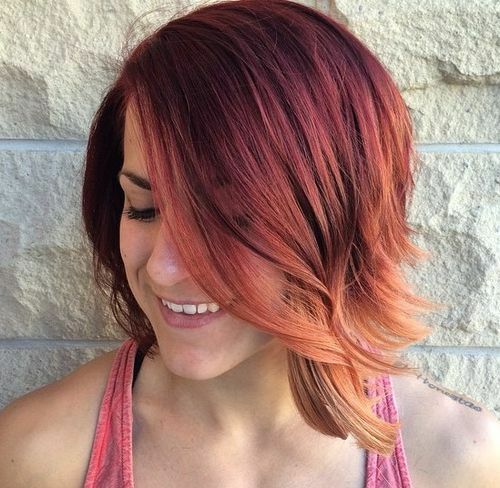 It works from a beautiful dark red to a light and bright copper shade at the tips in an ombre transition, and the ends of the hair are curled to create this cute and bouncy silhouette we just adore. 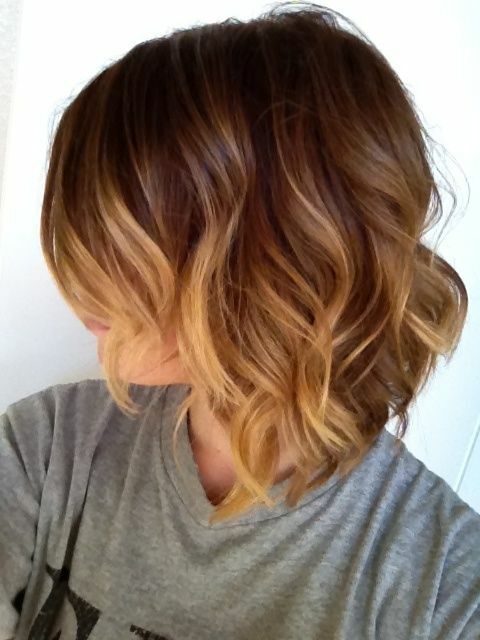 This is really a cool ombre bob cut. 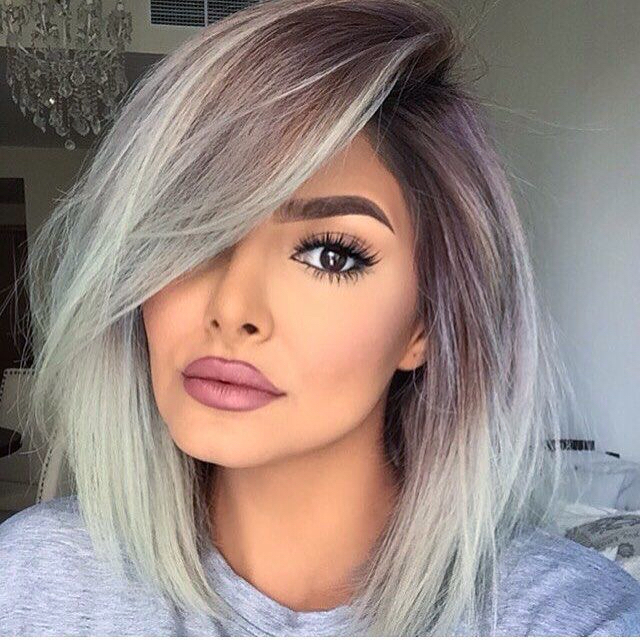 This absolutely gorgeous hairstyle has stolen our hearts! This incredibly beautiful pixie cut is finished in lots of short layers from around the ear length up, finished with a gorgeous sweeping fringe across the forehead. Her hair works from a dark blonde to a light blonde through an ombre blend, and curls are worked throughout the hair for a wonderful tousled edge. 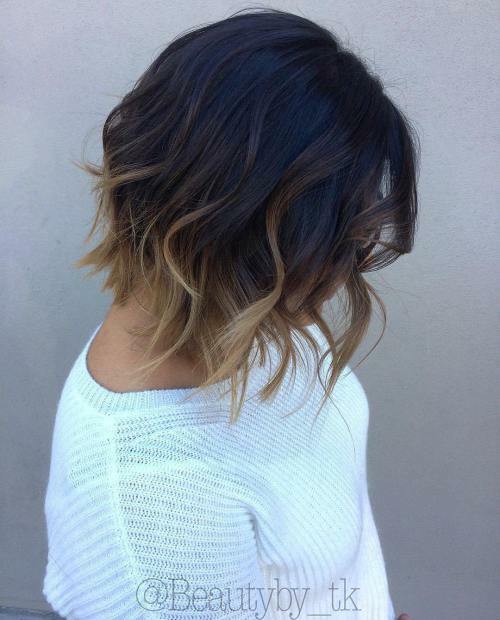 Do you love this short cut? 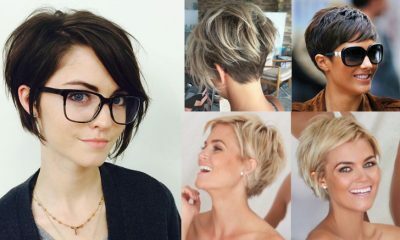 Find more short hair ideas in this post. 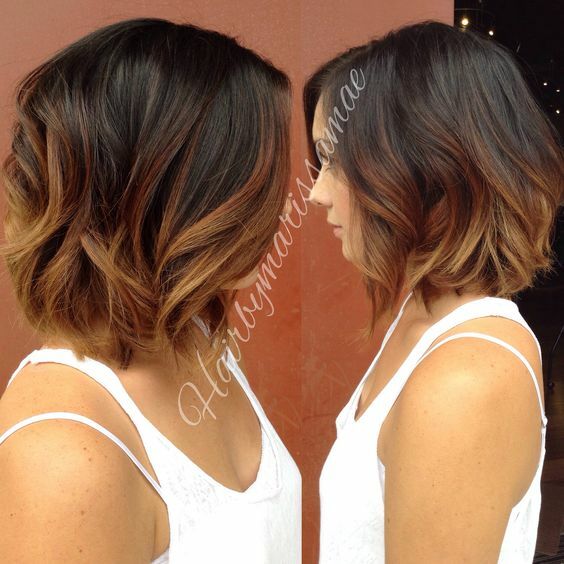 This absolutely beautiful bob is chopped in an edgy line above the shoulder length. Working two fabulous colours into one look, this stylish lady has worked a bright silver into a gorgeous bubblegum blue through a wonderful ombre transition. The hair is curled to create this incredibly bouncy and voluminous finish that we utterly adore! 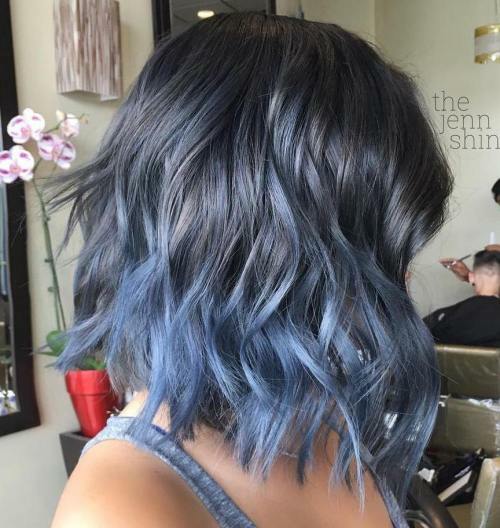 And here are more blue ombre hair ideas, check it out! 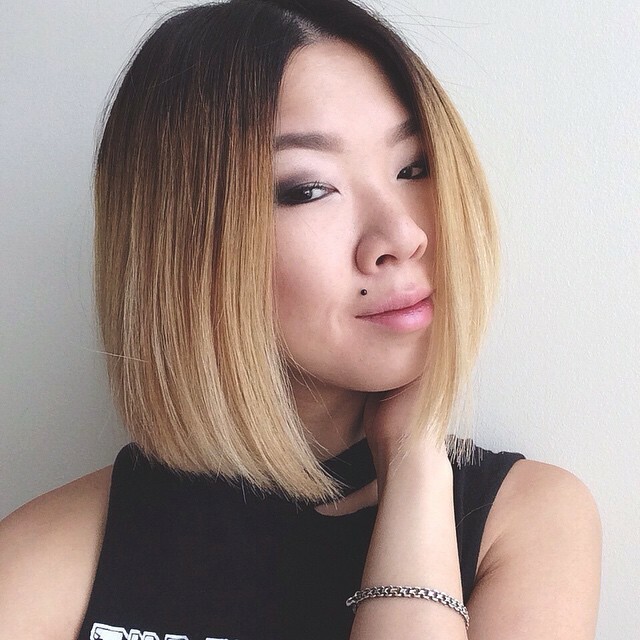 This amazing cropped bob is the perfect example to start our gallery of gorgeous short hair with an ombre style. This beautiful crop finishes above the jaw level, and works from a rich and dark brown at the root through to a lighter brown at the tip. This amazing style is finished with corkscrew curls from top to bottom to highlight the colour change. 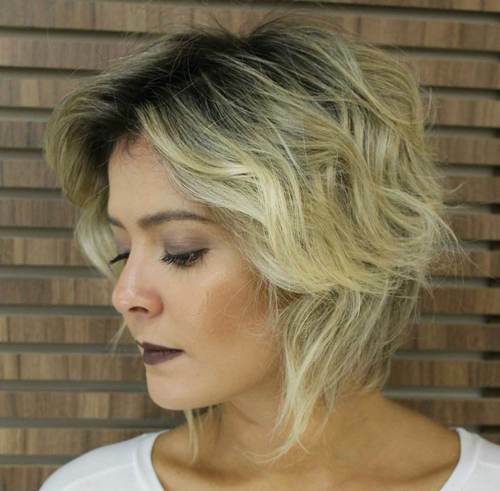 This stunning lady has proved that a gorgeous ombre colour transition even works on a pixie crop! This lady’s gorgeous hair is cut very close to the head on the bottom layer, with the top layer falling ever so slightly longer to create this sweeping style. 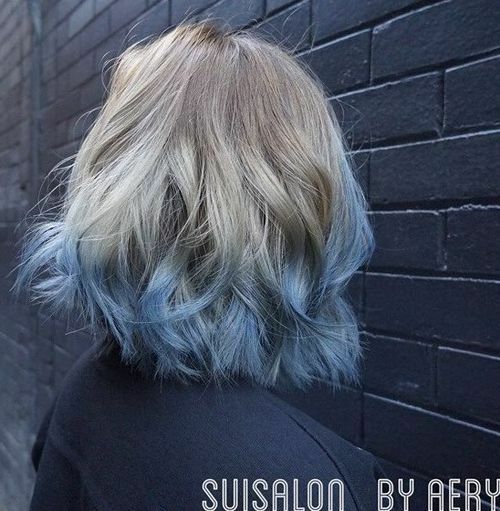 She’s opted for a deep, denim shade of blue which blends into an icy light blue for the colour which we just adore! This beautiful stacked bob has lovely, longer layers around the front of the face, which graduate to shorter layers at the back of the head. She’s created this fantastic wedge finish which is full of volume and vibrancy. Working from a dark brown to a light blonde via ombre transition, this gorgeous lady has worked her hair into loose waves to accentuate the colour transition. This absolutely beautiful straight bob is gorgeous – it’s no wonder this pretty lady is smiling, don’t you agree? Her hair finishes ever so slightly longer at the front, falling around jaw length, and shorter at the back. Parted in the centre, the colour blends from brown to copper and blonde on the tips. Her hair is parted in the centre for a sleek style. 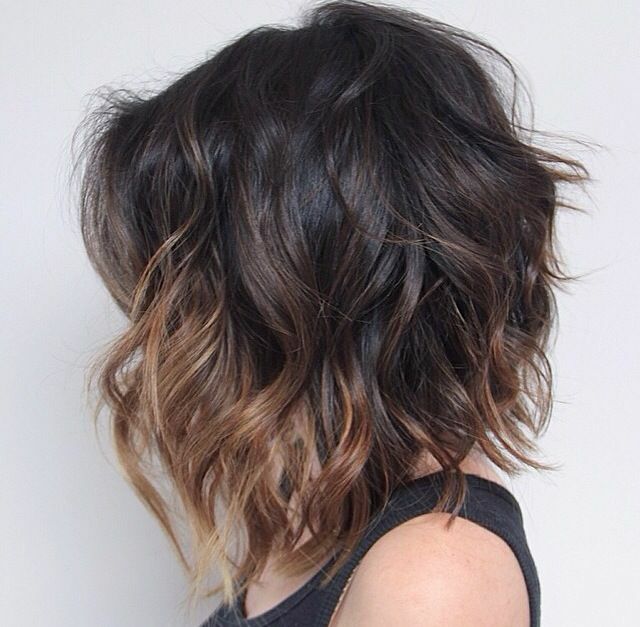 This gorgeous asymmetric bob is oh so swoon-worthy, don’t you think? Starting with a short layer on one side and finished with a lovely, long and sweeping fringe on the other, we absolutely adore this short cut. The bulk of the hair is a rich chocolate brown, which blends into a gorgeous blonde right across the curled fringe section. We love this look. 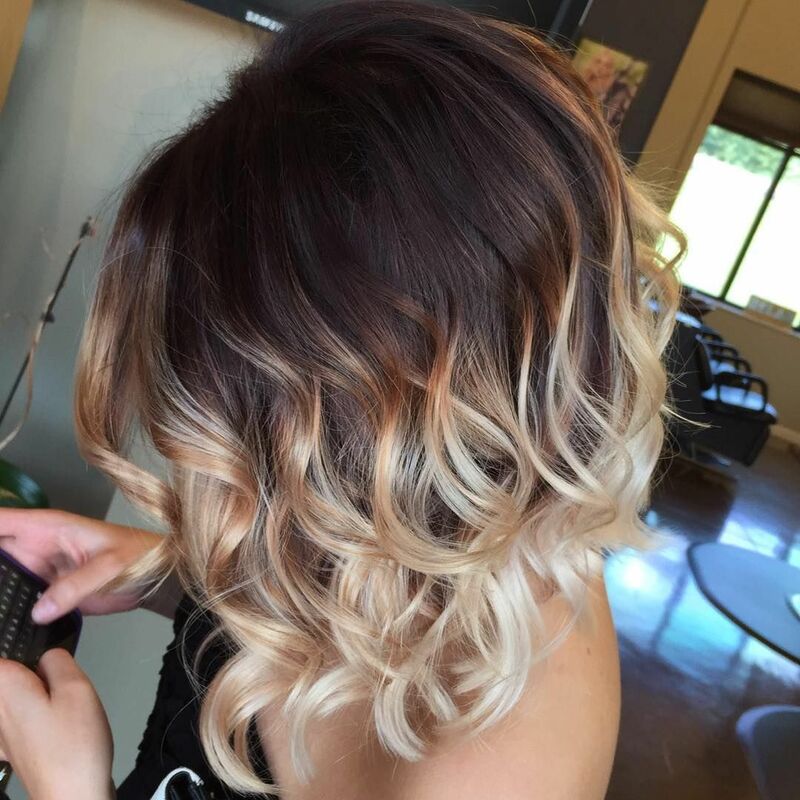 The balayage hair styles also really hot these days, if you want to try the balayage tech, check out the latest hottest balayage hair color ideas here. This gorgeous crop is oh so stylish – this girl looks like a model! The back of her hair is a lovely dark brown and is cropped incredibly close to the head, and the top is finished with a longer layer which is brought forward to create this incredible quiff style! The quiff has been worked into a stunning copper shade and finished with a rough tousle. 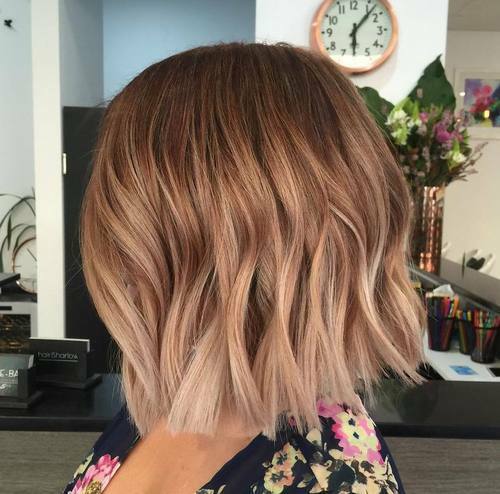 We are in love with this ombre colour transition! This lady has worked a dark purple shade which is oh so glossy into a bright and warming blonde on the tips of the hair, made even more gorgeous because of this incredible bob style, which is ever so slightly shorter at the back of the head and longer at the front. She’s added curls throughout to show off the colour blend! 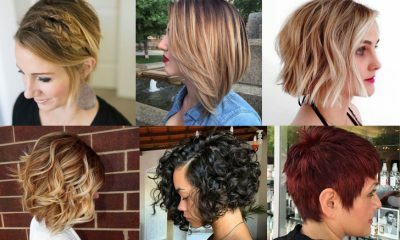 Check out the latest most popular bob haircuts for women here. This lady is looking pretty pleased with herself – and after one look at her remarkable hairstyle it’s really not difficult to see why! 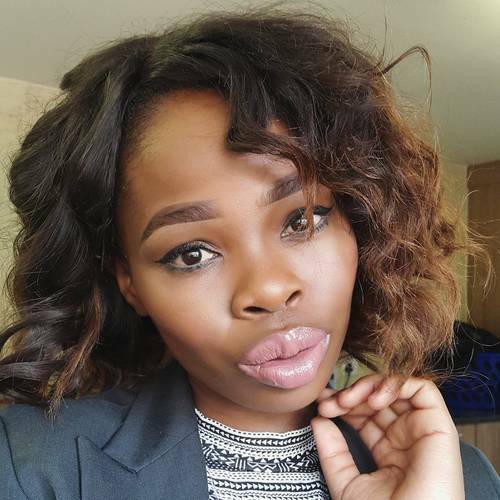 Her short bob works from a gorgeous and rich chocolate brown at the root of the head, and blends towards a caramel shade around the front of the face. She’s curled the hair backwards around the face for this gorgeous look. 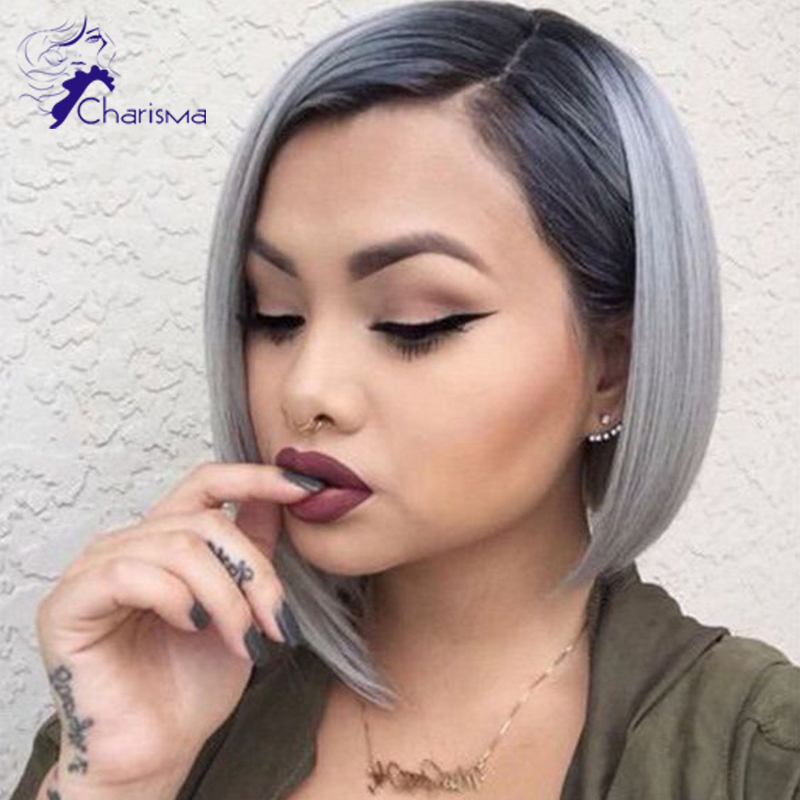 This remarkable and sleek bob is absolutely gorgeous, finished with absolute precision to create a razor sharp look that we cannot get enough of! The edge of this bob is finished in a super straight line an inch or so below the ear, and the beautiful curved bob works from a striking hot pink at the root to a gorgeous and vibrant silver at the tip. This wonderful bob has such a vibrant colour scheme that it most definitely is designed to attract attention – for all the right reasons! 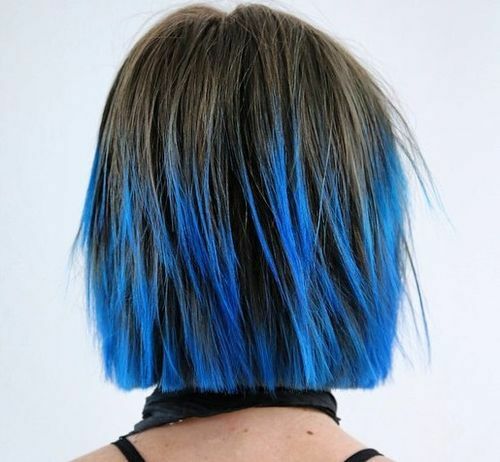 Her beautiful black roots are glossy and striking, fading quickly into an electric blue colour through an ombre transition. The hair has been cut bluntly, and finished with an edge and tousled look. The gorgeous Dannii Minogue is pictured here – and who wouldn’t want her hair as inspiration? Here stunning curly crop Finishes with slightly longer strands towards the front of the face, shorter at the back, and is worked with lovely loose curls on the end. 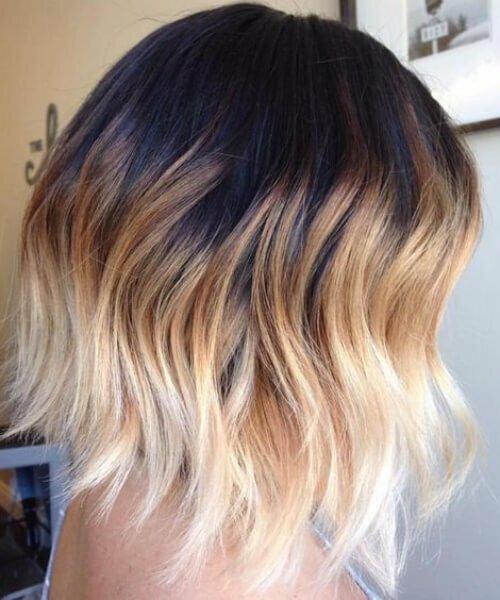 The brown to blonde ombre transition is to die for, and we simply cannot get enough of this look! 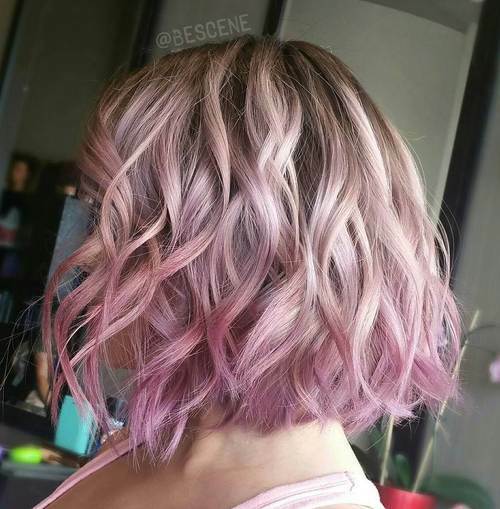 We are swooning over this pastel perfection hairstyle! 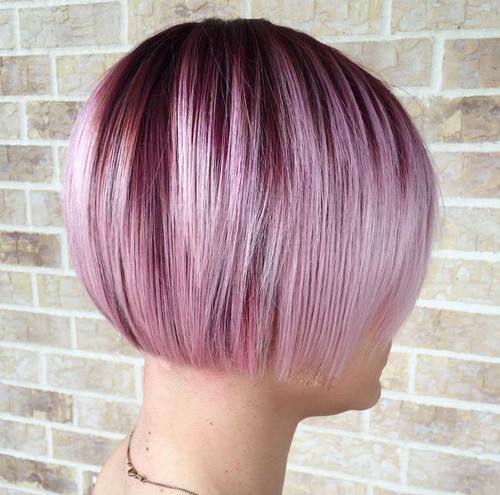 This gorgeous bob starts a bright white shade which blends quickly into a gorgeous pink colour at the tips. This lady has worked lovely ringlets throughout the hair to show off this amazing colour transition and to create a fantastic, vibrant and voluminous look that we simply cannot stop staring at. 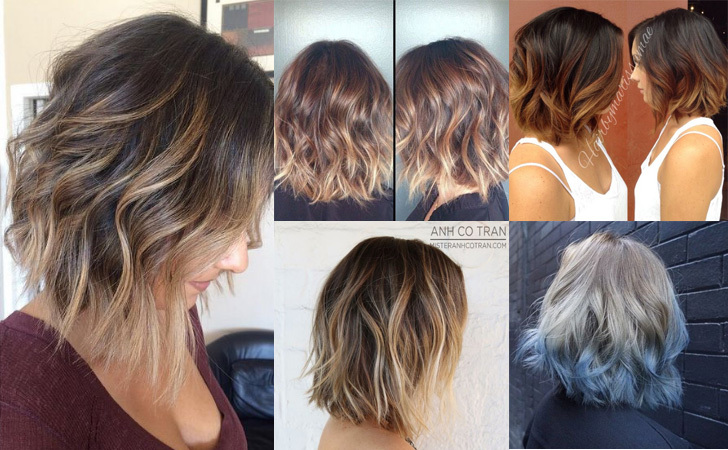 And here are more hot ombre hair color ideas for you to choose from. 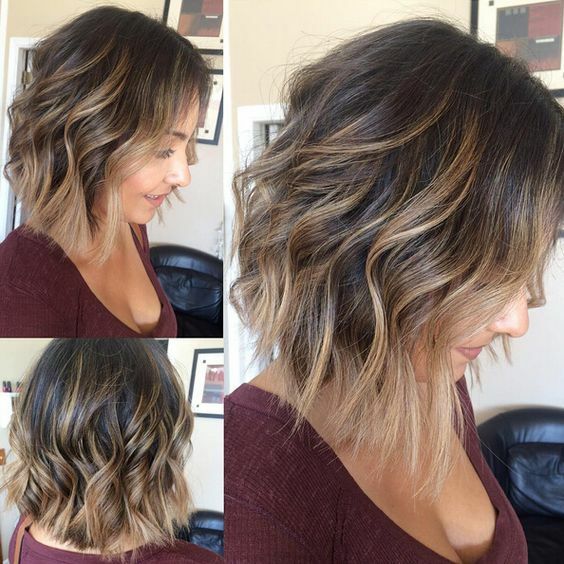 This bob is so full of volume it’s almost impossible to take your eyes off it! Her hair starts from a lovely and glossy blown, which blends into a deep caramel shade of blonde. The hair graduates from a shorter layer at the back of the head, to a lovely long layer which falls around the face. The ends of the hair are curled and back combed to create this bouncy style! Need curly wigs? Check it out here. 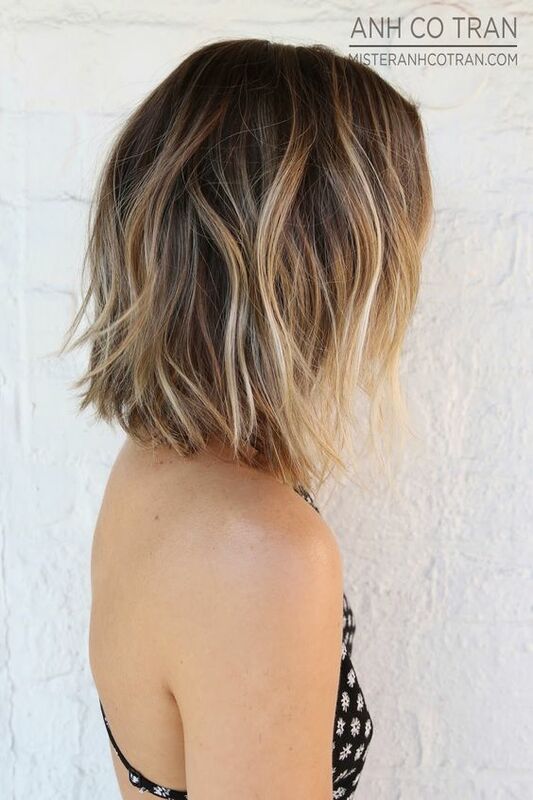 This fantastic and blunt bob is such a gorgeous combination of colours that we think it might be one of our favourite looks for this entire gallery! 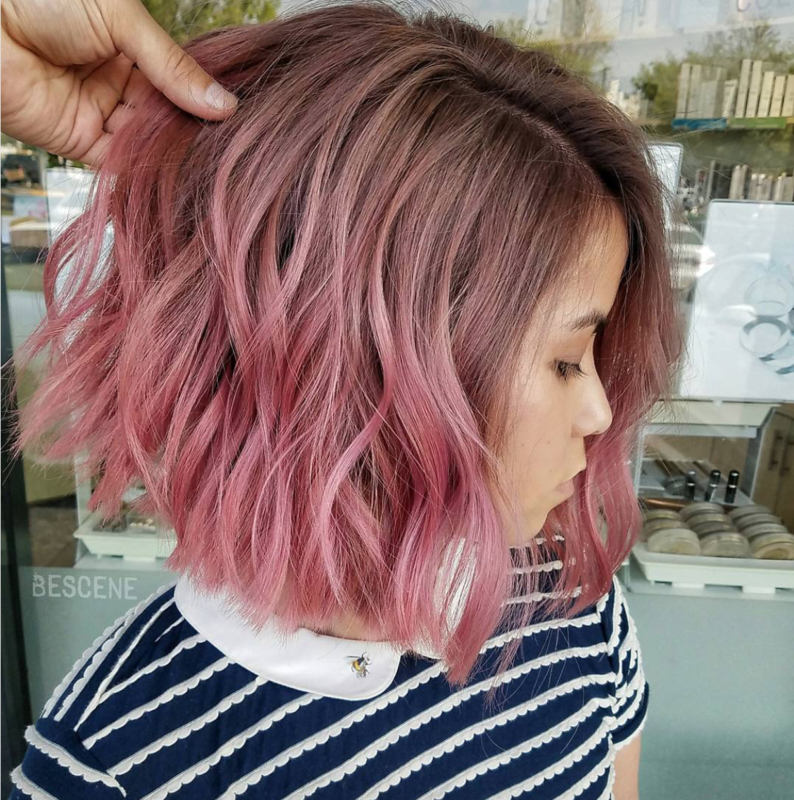 Starting a lovely brown and blending through a lighter brown, finishing with an ash blonde, this look almost has a pink hue, don’t you think? 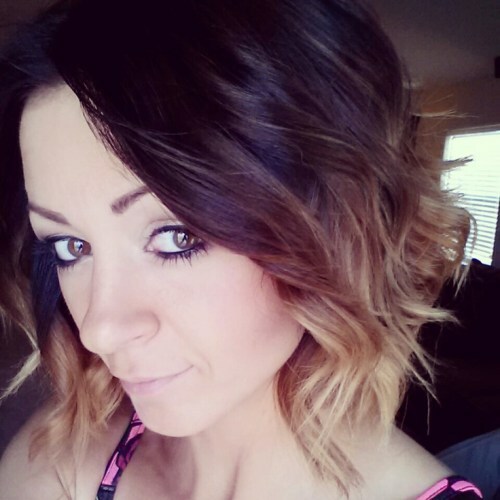 She’s added loose waves to this bob for the ultimate party fashion. 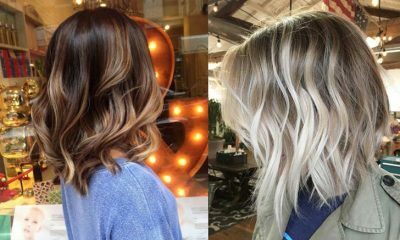 We hope this blog post has proved that short hair does not mean you can’t rock a gorgeous ombre transition – especially thanks to these lovely ladies and their hairstyles! Let Her Style Code know what you think – we just love to hear from you.